March was kind of a struggle for me budget-wise. 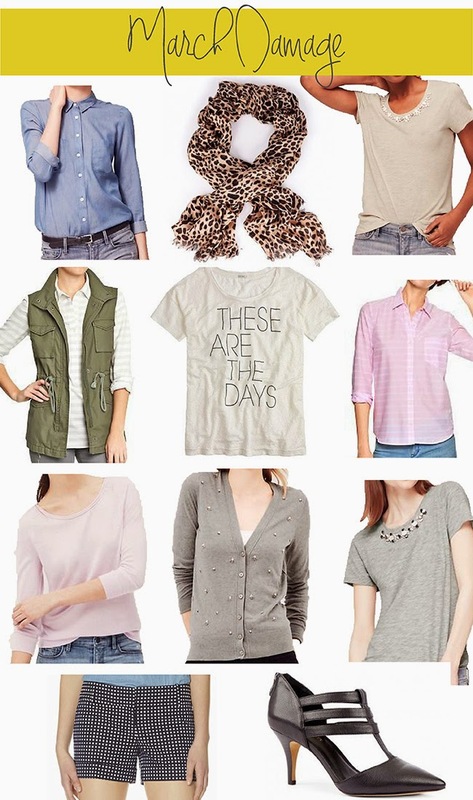 I stayed under somehow, but when spring arrivals hit the stores I had a hard time holding myself back. Pretty pastels and jeweled details were really catching my eye this month, as well as other impractical things that I won't be able to wear for a few months (silly Chicago). In looking at how much I got this month, it seems like a LOT. I cleaned out my closet and gave a lot of stuff to my sister, so it seemed like there was some space to fill. I think for April I'm going to try to buy fewer overall items. I do have my eye on some pretty spring dresses and block heels though, so who knows! Those necklace tees from the loft are super pretty. Plus, you don't need to wear jewelry! You got some great stuff though! and as far as saved vs spent, you did good. I can see why you didn't hold back, these are all amazing pieces! You got some great pieces and stayed below your budget so you did awesome! I'm also on the hunt for versatile dresses that I can wear all summer long. Can't wait to see what you find!